So we thought how lovely it would be to use it instead of skewers for vegetable kebabs as part of our barbecue lunch yesterday! We went for mushrooms and peppers as our vegetables, as the mushrooms cook fairly quickly and red pepper charred at the edges but still crisp in the middle is delicious. The basting sauce uses lime powder, but you could substitute lime zest if you like, it won’t be the same but will still be tasty. The vegan basil mayo is a lovely indulgent sauce to go with them, it uses xanthan gum and lecithin powder to thicken and hold the volume of a soy milk, vinegar and oil mix. The recipe makes more mayo than you’ll need for the kebabs, but it keeps well for a couple of days in the fridge and is tricky to make in smaller quantities. We used the extra to make a simple potato salad, which was delicious. For the kebabs, first mix together the cider vinegar, tamari, oil and lime powder. Using a skewer (or drinking straw as I did!) 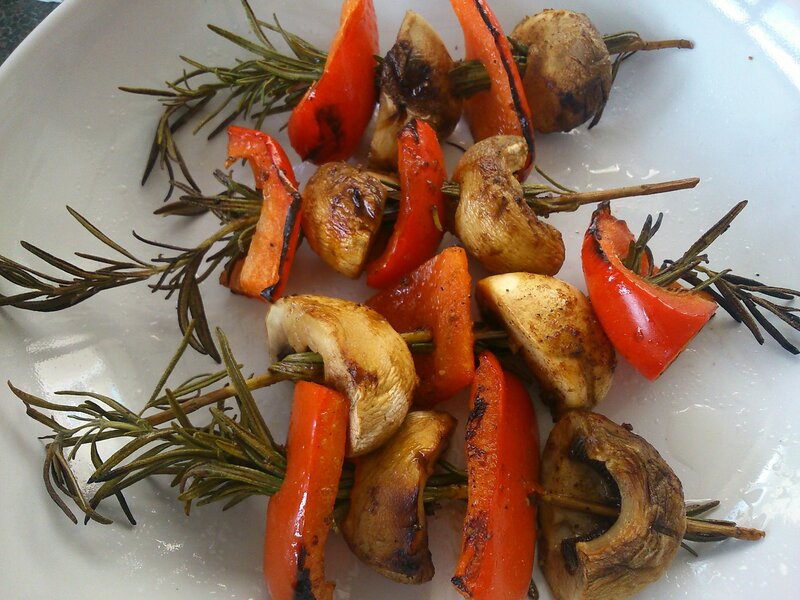 poke holes in the mushroom and pepper pieces so that they’ll thread easily onto the rosemary. Wash the rosemary sprigs (it’s better if they’re a little damp when they hit the barbecue to avoid burning), and if they are particularly bushy, remove some of the leaves. 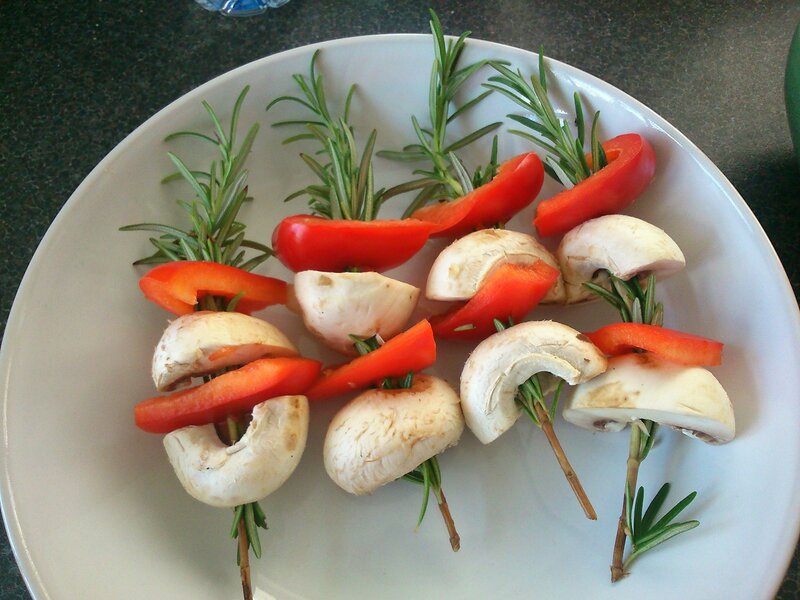 Thread the vegetables onto the rosemary, two pieces of mushroom and two pieces of pepper per sprig. Drizzle a little of the basting sauce over the kebabs, and barbecue for 4 -5 minutes, basting often with the sauce. Turn the kebabs and repeat. To make the mayo, mix the soy milk, oil, xanthan gum, lecithin and 1 tbsp of vinegar together using an electric whisk until thickened and increased in volume. Add salt to taste and a little more vinegar if it needs it. Fold through the basil.